When I got back from China, Christmas had arrived in New York. It was also dark at 4 p.m., which is rather depressing. But with Christmas comes markets and the Union Square Christmas Market is so festive and cheery. Last year, we bought many of our presents at this market, gifts that are totally unique and you can find inspiration for that impossible-to-buy-for family member. You can also try a slice of Momfuku's famous Crack Pie, available here at a tiny pop-up Momofuku. I don't get the hype with the Crack Pie; to me, it tasted like eating a stick of butter. It is fun to watch fans of the pie inhale their slices, licking the oil off of their fingers. Yum. 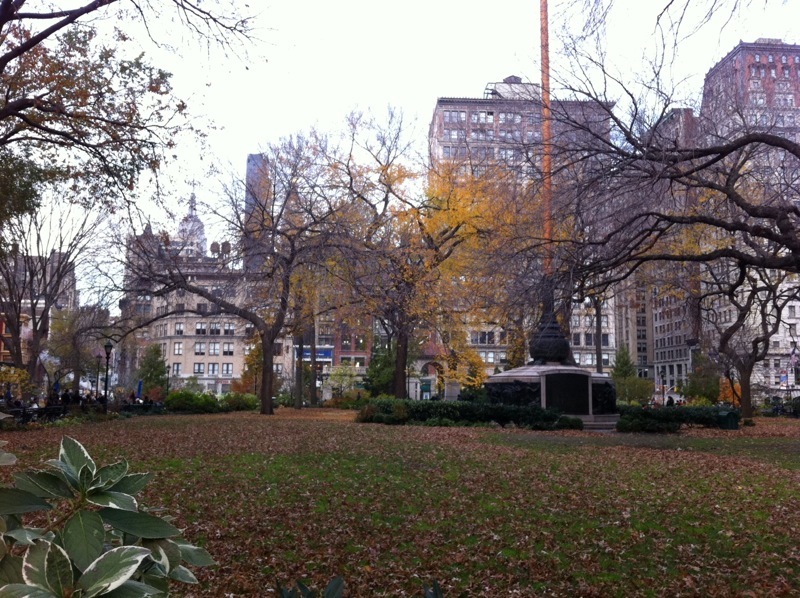 I love this fall snapshot with the leaves on the ground in Union Square and the Empire State Building looking small peeking through the trees and buildings.